A bridge is a fixed dental prosthesis used to replace a missing tooth (or several teeth) by joining an artificial tooth permanently to adjacent teeth. 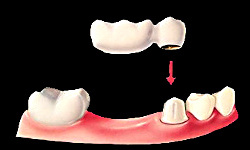 The bridge is attached to the teeth either side of the gap in your teeth so creating a permanent replacement. A bridge is permanent and cannot be removed. How a bridge is done? After a consultation with our dentist, two visits are usually required. The first visit to prepare your teeth and take impressions. During this visit, a temporary bridge is placed in your mouth to protect the exposed teeth and gums. During your second visit, the Dentist removes the temporary bridge and places the permanent bridge in your mouth. The crowns are cemented to your two healthy teeth on each side of the missing tooth. There are different types of dental bridges. Our dentist will recommend the most appropriate one depending on the location of the missing tooth (or teeth) and the condition of your teeth, mouth and gums. 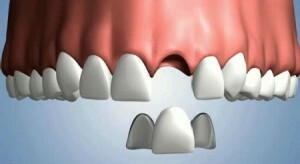 Traditional bridges are used if there are natural teeth on each side of the gap where the tooth is missing. The custom made artificial tooth is fused to two crowns. This is called a Bridge. 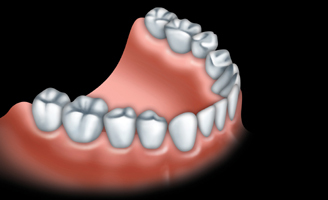 Cantilever bridges are used when there are healthy teeth on only one side of the missing tooth or teeth. 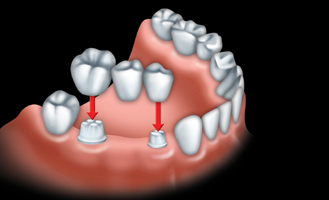 This procedure involves anchoring the artificial tooth over one of your natural adjacent teeth. Cantilever bridge with healthy tooth on only side. You need to clean your bridge every day, to prevent problems such as bad breath and gum disease. You also have to clean under the false tooth every day. Our dentist or hygienist will show you how to use a bridge needle or special floss, as a normal toothbrush cannot reach. If you take good care of your bridge, it should generally last for about 10 years, or perhaps longer. Regular dental visits and professional cleanings are also important. If you are considering about Bridges, Please call us on 01325 284808 to book your appointment.